One Million Deaths in Syria ? Really ? Really ! 1. How does a war doctor get to the figure of 1 million deaths ? 2. Are these figures correct ? The world was shocked when Staffan de Mistura, the UN Special Envoy for Syria, mentioned in April 2016 a death toll of 400,000 people. The last figure that the UN had put forward was 250,000. That was back in 2014. In the meantime they had stopped counting because it was difficult to corroborate the data. Did the world really think, that people stop dying when you stop counting the death ? Anyway, Staffan de Mistura emphasized that his calculation was not an official figure. The Syrian Center for Policy Research (SCPR) though came to a similar verdict. In an often cited study they estimated that the Syrian death toll could reach the number of 470,000 people. Those figures were released at the beginning of 2016, the worst year of the Syrian war so far and that had just begun unfolding. But it was the French doctor Raphaël Pitti who pointed out that even these figures might have been a huge underestimation of the real death toll of the conflict. Dr. Pitti is a war doctor, who during the civil war trained medical personal in Aleppo, and who knows like no other the medical situation on the ground in war torn Syria. He explained in a radio interview for France Inter, December 12, 2016, that for every person who died through the impact of direct armed violence (the normal casualty figures), you have to add at least one person who died through war-related sickness and hardships. That is because the regime systematically destroyed hospitals, medical facilities, drink water stations, electricity plants,…killed doctors and nurses. In those areas that were under siege (mainly by the regime), apart from food, medical supplies were not allowed in. As a result, people with high blood pressure, sugar sickness, heart disease, kidney failure… simply died out of lack of medication. Babies, mothers who had just given birth, the elderly, simply died because there were no doctors around who could attend to them in cases of emergency. And if they were around, they would not have the means to help them. On top of that, people died from hunger, lack of (clean) drinking water or cold. Given that 500,000 people died a violent dead, Dr. Pitti concluded that the real death toll might easily reach one million. Our first answer is actually a question that might surprise you. Does that really matter ? Should we let criminals commit war crimes as long as they haven’t massacred one million people ? Or, let’s put the same question in an other way : from which moment onwards are we willing to take action : from thousand murdered, from ten thousand murdered, from hundred thousand murdered, … ? The answer to that question is, that in International Humanitarian Law, it are rather the types of crimes committed that matter, than the numbers of victims. But still, let us have a look at those numbers. The fact is that making a correct calculation of the casualties is very difficult. The Syria Center for Policy Research, for example, based it’s calculation of direct (violent) deaths on estimations from around 2000 people, presumed experts, from all over Syria. On the other hand you have those organizations who conduct “body counts”. One of the most renown ones is the Syrian Violation Documentation Center. They counted so far (April 27, 2017) 105,911 civilian casualties and 44,241 non-civilian casualties. From the 105,911 civilian casualties, 11717 were women, and 18947 were children. Those organizations face the difficulty though that they cannot be everywhere, and as such, they don’t pretend to list all the casualties. A major complicating factor are the regime’s and some rebel groups’ attempts to destroy evidence and to eliminate witnesses. Especially doctors and nurses have the means and organization to record victim numbers and have been valuable sources of information. That is one of the main reasons why the Assad regime systematically destroys hospitals, medical facilities and makes, apart from (citizen)journalists, doctors and nurses targets of aimed attacks. A recent example were the attacks on hospitals after the chemical attack on Kahn Sheihoun on April 04, 2017. Furthermore does the regime, with the help of Putin’s veto’s in the UN Security Council, not allow independent fact finding missions. When committing crimes against humanity, dictatorial regimes have many means at their disposal to destroy, hide and fake evidence. And we know that they do just that. Presumed innocence, a rule of law in normal circumstances, cannot be applied when the criminal, in this case the dictatorial regime, decides which evidence he will release and if this evidence can be verified or not. That is why we have to assume the worst case scenario, unless a full, independent, and unhampered investigation into the crimes can be conducted. An element that can help us in gauging in how far the information that reaches us is realistic, is the historic information about recent wars. Between 1992 and 1995, during 3 years and 9 months, Bosnia-Herzegovina was the scene of one of the till then most brutal civil wars in recent history. It is also one of the best studied civil wars. During these 3.75 years approximately 1 % of the civilian population was killed. Though this figure is said to be rather conservative and the real percentage might be a bit higher, it was established after years of collecting evidence and seems to have a strong scientific foundation. Notwithstanding the many similarities between the two conflicts, there are also distinct differences. This on its turn might explain why the known casualty distribution between civilians and non-civilians is very different between the two conflicts. Whilst in the Bosnian war the number of killed non-civilians was almost double the one of civilians, in the Syrian war the available body counts tell us a different story, the civilian population suffering double the losses of the non-civilian. This pattern corresponds rather to the Russian-Chechen wars (Dec 94 – Aug 96 and Sept 99 – May 2000). Taus Dzhabrailov, back in 2005 head of Chechnya’s pro-Russian interim Parliament, took everybody by surprise when in August of that year he told the Russian news agency Interfax that between 150,000 and 160,000 people (combatants and non-combatants) had perished during those two wars. Was he drunk that he broke the Russian omertà surrounding the casualty figures of the conflict ? Should we assume that the old Latin saying, in vinum veritas (in wine there is truth – for Russians rather : in vodka there is truth) applied when he spoke out ? His declaration though gave the statement of the former Russian Secretary of the National Security Council, Aleksander Lebdev, that during the 1st Chechen war between 80,000 en 100,000 civilians (between 6.6 and 8.3% of the civilian population) had been killed, more credibility. Analyzing the figures given by the former head of the pro-Russian Chechen parliament, we reach a civilian death toll of about 10 % of the population. A carnage comparable to the slaughter perpetrated by Hitler’s army on Russian soil. On the other hand, the death tolls human rights organizations have established are much lower. They estimate that around 6 % of the population perished in the onslaught. 4 % during the 1 year and 9 months of the first Chechen War and 2 % during the 9 months of the second Chechen war. No matter which of those figures lies closer to the truth, fact is that they are staggering high, and prove that within a relatively short period a high percentage of the civilian population can be murdered. A circumstance attributed to the reckless air bombardments and shelling of densely populated urban areas by the Russian army. Exactly the scenario that we have seen unfolding during 6 years in Syria. And what about Dr. Pitti’s assumption that for every person who died a violent dead (in general the figures referred to in the reports and body counts disseminated by the media), we have to add at least one person who died from war-related hardship and sickness ? This was actually not simply a loose assumption, but a statement based on serious scientific research. Dr Pitti’s estimation of 1 indirect death for every direct death could rather be a very prudent estimate when we compare the brutality of the Syrian war with its numerous sieges that locked up hundreds of thousands of people, the systematic destruction of hospitals, medical infrastructure, drink water stations, etc… to the Iraq war. The Syrian war is a mixture between the Bosnian civil war and the Russian-Chechen wars. The large scale use of air bombardments and the length of the conflict (as per March 2017 6 years, with 2016 as the most brutal so far) make it very probable that the direct civilian death toll is much higher than the 1 % in 3.75 years of the Bosnian civil war, but maybe not as high as the 6 to 10 % in 2.5 years of the Russian-Chechen wars. As a result could Dr. Pitti’s assumption of December 2016, that there might be 500 0000 direct deaths even represent a very conservative estimation. His assertion that we have to add at least one indirect death for every direct death, came not simply out of the blue, but has strong scientific evidence in support. 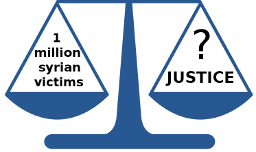 One million deaths as a consequence of the Syrian war is thus absolutely a figure with a high probability value, but doesn’t even represent the worst case scenario : the actual number of victims could even be higher. Since we are dealing with a totalitarian regime, it is this worst case scenario that should determine our actions, until a full, independent and unhampered investigation into the crimes can be conducted.